“French from Britany, French Algerians, French Moroccans, French who suddenly discover that they are Algerians, jazz musicians who suddenly discover a passion for the Maghrebian 6/8… and begin to sing in Arabic, Berber or Turkish and to dance like the Gnawa… These funny boasters make up the FANFARAI band, a Rai UFO matured in the copper sun of North Africa which breathes intercultural harmony and offers a sensory journey … without visa… to the southern shores of the Mediterranean,Turkey and elsewhere. ” Great happiness and strong emotions are always there with them on stage ! Fanfarai offers a true human, musical and cultural experience. These eleven musicians of various cultural backgrounds revisit, in their own ways, the tradition of festive wanderings. Fanfarai emerged in 2005 under the direction of Samir Inal. 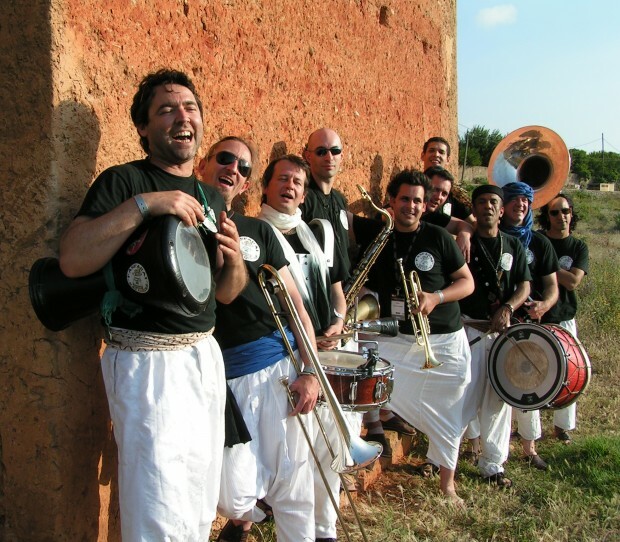 After creating ZIYARA a traditional Algerian Street band in 2000 he met with musicians coming from jazz and salsa bands and decided to readapt with them the traditional and popular repertoire for a brass band. FANFARAI goes along the same line as the tradition of these street orchestras, called “Idbalen” or “Zernadjia” that animated rituals and feasts in Algeria from the beginning of the century till the 1970’s. Idbalen was common in the Berber region, Algiers and its surroundings. These bands used to perform in public squares, streets and mausoleums during the feast of local saints. Inseparable from festive events, these street musicians used Tbel (drums), Ghaita (flute) and Tbilette (small drum or tambourine), Derbouka, Guellal and Kerkabou according to their region. The North African music has never been played this way (with a brass band) and this is what makes Fanfarai so original and the project so successful. The music of Fanfarai is a cheerful combination that is as interesting as the diversity of cultures and trajectories of the musicians themselves. French, Algerian, Marocan, Franco-Italien musicians bring their energy and talent together and keep sharing their own particular musical heritage with all the other members of the band. The basis of the repertoire of Fanfarai is Algerian and Moroccan and each member of the band is free to bring his own influences onto it. Fanfarai succeeds on each performance – in the streets or on stages – to carry its audience away beyond ethnic descent or nationality, towards territories of tolerance, discovery and pleasure. The leitmotiv of the band is : ” to learn from one another and to share with all ”.